Technical debt is accumulated future work that has amassed as the result of decisions made during the development of software (or more generally during the development of information systems). The term was coined in 1992 by Ward Cunningham, who realised that as soon as software is created there is an element of deferred work, which can be equated to “going into debt” (Cunningham, 1992). Analogously, technical debt is often equated to financial debt, such as a loan. The value of a technical debt is not dollars, but the cost of the time needed to rectify problems. As software is created, compromises are made between delivering a flawed but acceptable system now or delaying and delivering a superior system later. These compromises result in a backlog of work that needs to considered before a future release. Technical debt comes about when developers create less than ideal code. Fowler (2009) suggests that developers can do this deliberately or inadvertently. A developer can deliberately decide to use a quick-and-dirty solution now with the intention of replacing this solution with a better one later. “I’m not sure if that database query will scale, but I’ll write a TODO to fix that later.” Developers can choose to sacrifice non-essential software elements by failing to write documentation, avoiding creating reusable abstractions or failing to follow coding standards. Alternately a developer can inadvertently introduce problems into the code. This can happen through forgetfulness as deadline pressure builds or simply when the skill required to solve a particular problem exceeds a developer’s technical experience. “I’m not exactly sure how this code works, but I’m going to reuse it now as it seems to solve the problem.” This approach is sometimes referred to as Cargo Cult programming (McConnell, 2004). Fowler also suggests that technical debt can be introduced through behaviour that is either reckless (“I don’t know how significant this is but I don’t have time for it now.”) or prudent (“The cost of introducing this now will be greater than the cost we will incur by delaying our release.”). 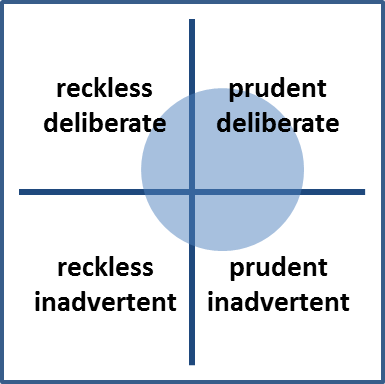 By crossing these deliberate-inadvertent and reckless-prudent dimensions as axes, four quadrants appear; these quadrants can be used to categorise the sources of technical debt. As no system is perfect, technical debt is something that cannot be avoided. It is something that needs to be managed rather than ignored. Technical debt, like financial debt, is not all bad. Any debt is doomed if there are no means to repay it. “Few of us can afford to pay cash for a house and going into debt to buy one is not financially irresponsible, provided that we know how to pay it back” (Allman, 2012). Projects need to consider the level technical debt they are capable of supporting and be aware of their technical debt at all times, ensuring that it does not exceed this level. If a software project accumulates more technical debt than can be “repaid”, the quality of the software becomes poorer. If lacking quality reaches a level that is obvious to users, this can affect their decision to use that software in future. What is “open technical debt”? Open technical debt is the technical debt accumulated by an open source project. To understand it you have to know that open source projects differ from commercial developments in terms of code ownership, project management and in the philosophy that motivates the project. Open source software is freely given to a community of users and that community is invited to provide feedback to the project to guide its future. Compared to a software system created by a commercial vendor, where the code ownership is simple, in open source projects the community owns the software and benefits from the effort they invest. Open source projects vary in scale from small projects, involving a small number of loosely organised volunteer developers, through to large-scale projects, that are bigger than many commercial software undertakings. The project I am involved in is Moodle, which involves hundreds of developers and has many thousands of registered sites with over 60 million users worldwide. The project employs 25 full-time employees and works with a large network of commercial Partner organisations who deliver services to the community and help support the project financially. Managing such a project is often difficult as there is no single product owner who you call on to make decisions and set priorities. When technical debt accumulates in an open source project and impacts on the quality of the software, it is obvious to the community. But this is balanced by the community’s sense of responsibility to fix these problems, improve the quality of the software and pay off that technical debt. In open source projects, strengths can also be weaknesses. The potential of a large community and large number of developers can lead to powerful software, but left unchecked it can also lead to technical debt. If that debt is not recorded and “paid off” it could lead to the downfall of the project. Where does open technical debt come from? It is important to be aware of where technical debt is coming from in a project. Using Fowler’s technical debt quadrants it is possible to categorise the sources of problems in open source code. You might think that most technical debt in an open source project is the result of reckless developers contributing code with inadvertent consequences to the project as a whole. In fact this is quite the opposite of the behaviour that an open source project elicits from developers. When someone contributes code, their code becomes part of the open source and is open to scrutiny by all. Metaphorically, their dirty washing is being aired for the entire world to see. If a problem is later found it is easy to track it back to a change made by a specific developer. This tends to lead to well-conceived code with a sense that reputations are on the line. As the person responsible for triaging issues as they are reported for the Moodle project I know every freckle and bump in its complexion. On a regular basis I track the sorts of issues that are left in our bug tracker and a large chunk of these are unfulfilled improvement requests. When releases are finalised, decisions are made to “draw a line”, even though improvements could be made. So the technical debt of the Moodle project, as an example of an open source project, is predominantly in the prudent-deliberate quadrant with lots of ideas for making the software better being known but not acted upon. Does this differ from a commercial project? Well I can’t say for sure, but I suspect it does. I would say that closed source software lacks the pressure that openness creates. Also, when the priority setting falls to a single decision maker with commercial deadlines to meet, I think that technical debt would shift more to the reckless side of this field. But then, I’m biased. While accepting that some technical debt is unavoidable, there are ways that it can be minimised. Having an open bug tracking system allows anyone to see what bugs have been reported and what improvements have been suggested. This means that the extent of the technical debt of a project is on display to all. Being open in this way creates incentives for developers to avoid creating technical debt in the first place, and to reduce technical debt in the long-term. It also shows the community that work is being done in a way that follows defined priorities. Following agile software development practices allows developers of an open source project work together to fulfil the priorities of the project. As priorities shift (and they do when you are responding to a community), being agile means that developers can respond quickly. In fact I can’t conceive of an open source project being managed any other way. Contributed code in an open source project is not automatically accepted. Before it is integrated with the codebase it usually has to satisfy experienced developers involved in the project. This is certainly the case at Moodle where all code goes through at least three levels of review before it is integrated into rolling releases and even more before major releases. When this is done politely, as well as ensuring software quality, this also helps to assure contributing developers and instil a sense of confidence. Once any software project grows to more than a trivial size, it needs to be modularised. In open source this is especially beneficial for two reasons. Modularity provides focus points for developers who want to contribute to a project without needing to understand the entire codebase. Modularity allows a project to designate code as official and unofficial. Official code is what is distributed to users as the core project code. Unofficial code can be plugins that individuals have written. Technical debt can then be measured against the official core code while keeping the potential “high-risk” debt of unofficial code “at arm’s length”. That’s not to say that developers sharing plugins should not be supported and recognised. As a project develops, changes will occur over time. Often modules become neglected, particularly if no one from the developer community has an interest in maintaining that module. When this happens, the community has to recognise the state of the module and deprecate it. Deprecation is like writing off technical debt; while it comes with a loss of functionality it also notionally frees up resources to focus on other parts of the project. Allman, E. (2012). Managing Technical Debt. Communications of the ACM, 5(5), 50 – 55. McConnell, S. (2004). Professional Software Development. Boston, USA: Addison-Wesley. I'm a husband, dad, manager and education technologist. Another point to make is that once an open source project is popular and successful, like Moodle, people want to get their contributions in. Therefore, it is feasible to enforce strict coding standards. People are prepared to make that level of effort. This is probably not feasible for a new project just starting out. Some very interesting ideas and thank you for a great insight into Moodle development. It would seem that Moodle should be generating proportionally less technical debt due to the improvement in the quality of its code base. The prudent/inadvertent quadrant is interesting to me. One of the problems with any codebase will be predicting what its needs will be in the future. If we make this decision now will that limit us later? It is very interesting how you describe modularity as often being a retrospective thing – oh yeah this should belong over here – an agile view that design is always happening. Again from an “open technical debt” perspective there should be more chances for this kind of reflection. So codebase peripheries can be sites of potential innovation. As in the genetic world most innovations (mutations) are harmful and die off, in our case they would be sloppy code, bugs or security holes. But occasionally something good crops up that is useful but also healthy. I am thinking of Davos DnD plugin. Then this innovation may eventually make its way into the core.